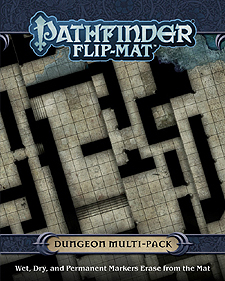 When you need a dungeon full of foul chambers and hiding spots for fiends and villains, Pathfinder Flip-Mat: Dungeon Multi-Pack has you covered. The four sides of this Flip-Mat Multi-Pack present levels in an interlocking dungeon. Each side connects to the set's other dungeon labyrinths, allowing any delve you run to last all night—and well into the next morning! With these handy dungeon maps, you'll be ready for anything the next time your players delve deeper and deeper! This set includes two flip mats, each measuring 24" × 30" unfolded, and 8" × 10" folded. Usable by experienced GMs and novices alike, Pathfinder Flip-Mat: Dungeon Multi-Pack fits perfectly into any Game Master's arsenal!